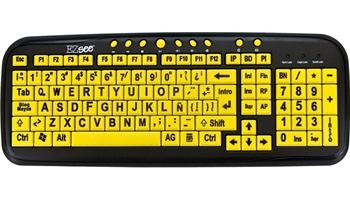 The DataCal EZsee USB large print Latin American keyboard provides easy to see computer keys with extra large key legends for greater visibility and efficiency. Designed using low profile keys, with the largest legends available on the market. High quality keyboard rated for greater than 10 million keystrokes.